Fully programmable data converter for access systems, with Usb interface. The converter has two inputs and two outputs. One of the inputs supports either track 1 magstripe, track 2 magstripe, or standard wiegand. The other input supports Usb serial. For Rs232 support, see the model 716 converter. Each input is programmed separately and operates independently of the other. Serial-to-serial masking, and preprocessing functions to support Amtech toll tags, are also standard features. 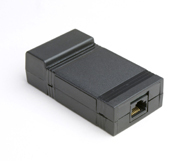 718 Data Converters are also avvailable with an on-board relay. See model 718R. Standard Wiring Type B Usb connector.